During thoughts on planning for fall classes, I had one of those ideas that wouldn’t let me go until I tried it. One of the classes I’m thinking about submitting is on pretty nalbound edgings and it occurred to me that nalbinding would make a lovely solid edge on other crafts. So a sample whipped itself up while dinner was in the oven. I eyeballed the number of stitches of nalbinding I’d need per double crochet stitch – 2 nalbinding stitches to 1 crochet stitch. So far I’m really liking the effect. 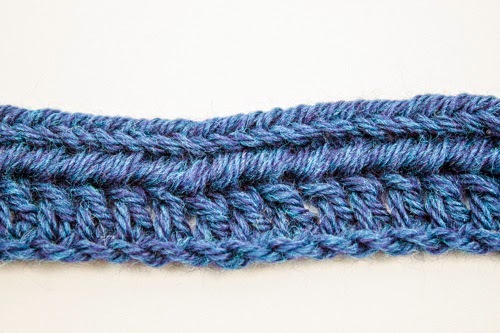 Crossing my fingers for more time to experiment tomorrow, for edging knitting with nalbinding. Have you ever edged another yarn craft with nalbinding?